Play the piano today with an easy-to-use instruction set! Piano For Dummies, 3rd Edition is an invaluable resource for anyone seeking fundamental piano instruction. Whether you're brand new to the piano or have been at it awhile, Piano For Dummies will soon have you tickling the ivories like a pro! This book contains all the information you need to start playing today, including clear instruction and supplementary materials. Learn different musical styles, like classical, rock, blues, and country, and how to find the perfect teacher should you decide to expand your instruction. The book also includes advice on practicing efficiently and improving your performance, as well as tips on how to pursue more advanced experiences. A great piano player is always the life of the party, and in high demand. 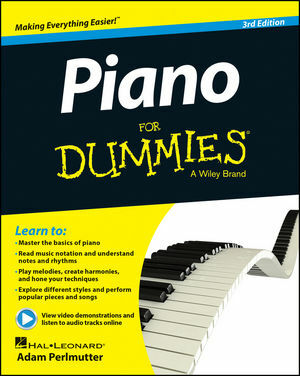 If you're looking to become one with the "88," Piano For Dummies, 3rd Edition is the resource you want!